Sales of mechanical security products in the US will rise 5.4 percent yearly through 2020 to $6.1 billion, driven by the large lock segment as it benefits from continued gains in building construction spending. Door security hardware will grow at an above average rate. The government/institutional and office/lodging markets will grow the fastest. 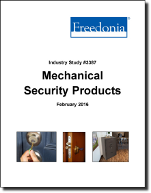 This study analyzes the $4.7 billion US mechanical security product industry. It presents historical demand data (2005, 2010 and 2015) and forecasts (2020 and 2025) by product (e.g., door locks, padlocks, safes, vaults, panic door hardware and exit devices, key blanks) and market (e.g., consumer, government and institutional, office and lodging, financial institutions, trade and distribution). The study considers market environment factors, details industry structure, evaluates company market share, and profiles 24 industry competitors, including ASSA ABLOY, Allegion, and Stanley Black & Decker.